Hello! 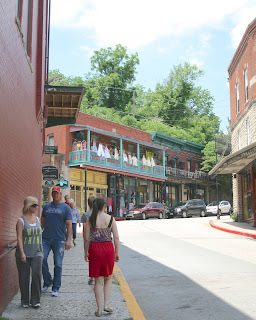 One of the biggest highlights of our early summer vacation was our visit to Eureka Springs, Arkansas. (If your confused by the title of my post, I realize it's not in Missouri, but it's close! It's about a two hour drive from Springfield, Missouri where we were staying). 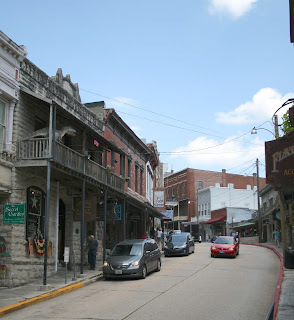 I wanted so much to talk about Eureka Springs in only one post, but I have so many photographs and stories to tell, it's impossible. Eureka Springs was for our family, the perfect vacation spot. 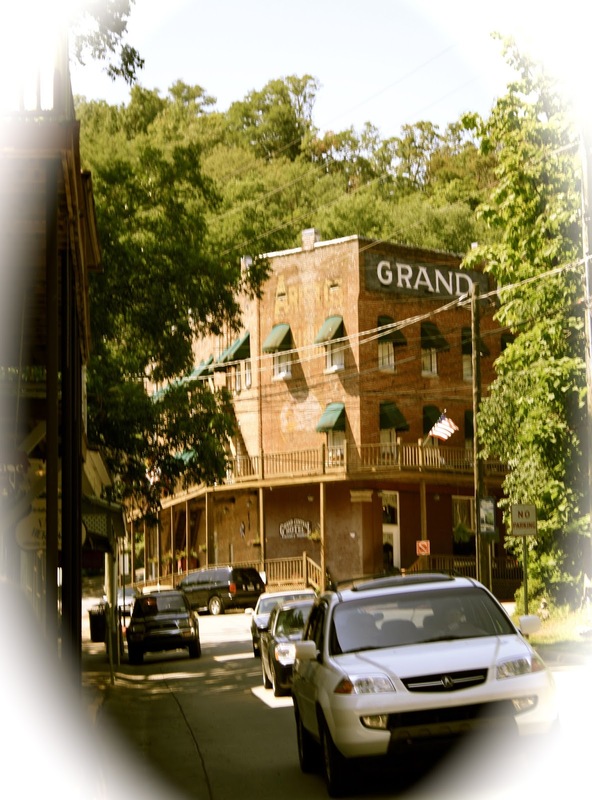 It's this idyllic little Victorian Village set in the beautiful Ozark Mountains. It encompasses everything we love: nature, history, beauty, and art. The first thing that struck me about this place, was that it was a rare piece of living American History. 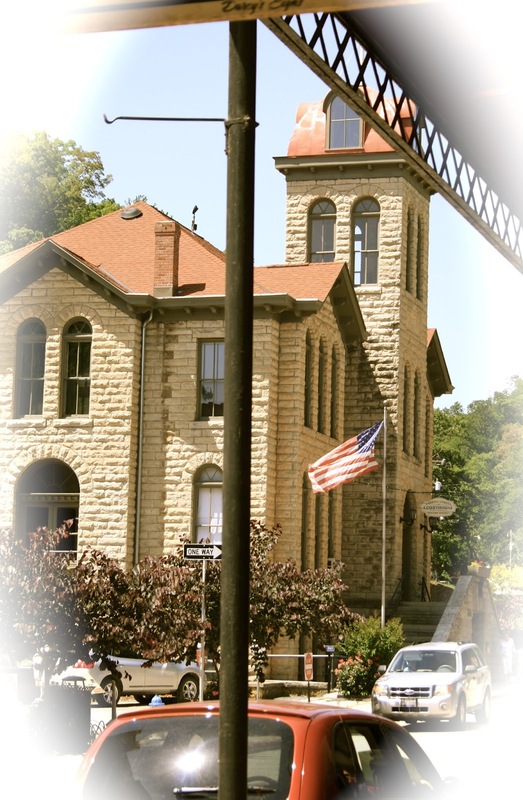 The ENTIRE CITY is listed on National Register of Historic Places. That's incredible. When I was in Europe a few years ago, I was awestruck that so much of their history still existed in the architecture. They don't tear things down in Europe and rebuild constantly like they do in America. In America, we lose so much of our history because we are constantly demolishing, destroying, and rebuilding. But when you step inside this town, it's as if your magically transported back through time. The picture below shows the very first building we saw as we entered the city. It's an old abandoned ice house. Here is one of the trains dining cars. We were so excited to arrive at this beautiful place, that we stopped our car at the first parking lot we spotted, and you wouldn't believe what we found there! A Musical Park! Now, remember in my last post where I discussed how my son, a musician, was suffering a little bit of depression on our trip because he couldn't play music for a week? Well, you can just imagine our joy at finding a park made for a percussionist. 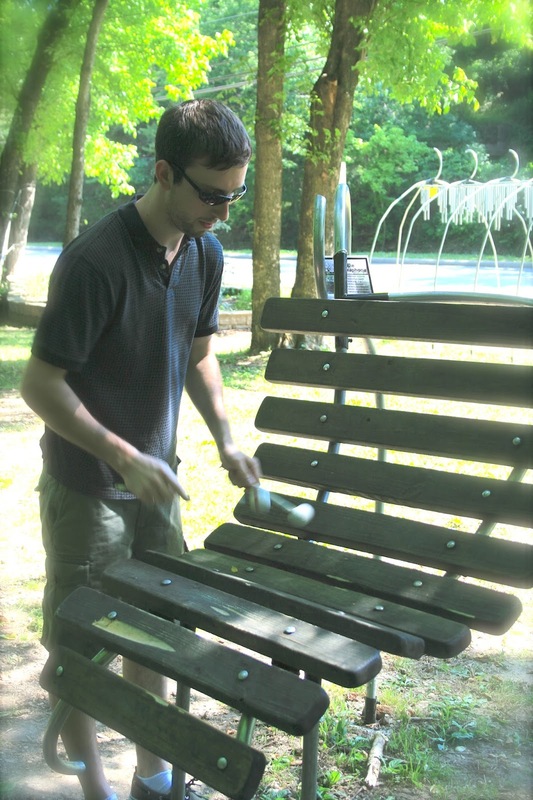 It was filled with percussion instruments, like this marimba type instrument my son is playing below and many others including the World's Larges Tuned Musical Wind Chime. My son's depression was over! After we watched our son play music for awhile, we started to stroll up the sidewalk leading into the city. We loved these 'Tree House Hotels' that we saw. All the little houses were up on stilts, like tree houses, and you could rent them just like a hotel room. 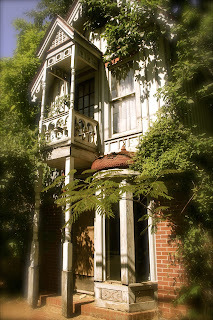 Here's one of many adorable, little Vintage Homes that we admired. It was like a dollhouse for adults! Another cute little home. Many of these little homes could be rented for vacations or weddings. This is definitely an artist's community. The city has many artist's events, parades, and festivals throughout the year. You could see the handiwork of artists wherever you looked. Below is picture of some shops where artists sell their creations. I love the iron flowers in front of the trees. Once we were done strolling up the beautiful, shaded neighborhoods, we started to enter the central, commercial part of the city. The street started to turn into an old-fashioned town. The roads were steep and winding, with multiple paths and walkways twisting and turning so you are always surprised by every turn. 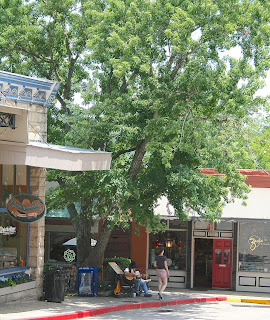 Many of the shops even have multiple entrances on different levels of streets. A local shopkeeper told me that I could never get lost in Eureka Springs because it's just one big five mile long loop (though I found it very confusing, and most of the time I had no idea where I was! LOL!). None of the streets intersect at a 90 degree angle like most city streets, and they do not have any traffic lights....so watch out! Many of the buildings look they were literally built right into the rocks, and rise and fall with the topography, and many are indeed built of local stone. 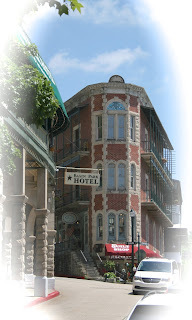 Below is the Grand Central Hotel which was built in the late 1880's . We were able to step inside and look around the foyer. It was very small, rustic, and reminded me an old Wild West Hotel. Very Simple, yet grand in it's simplicity. 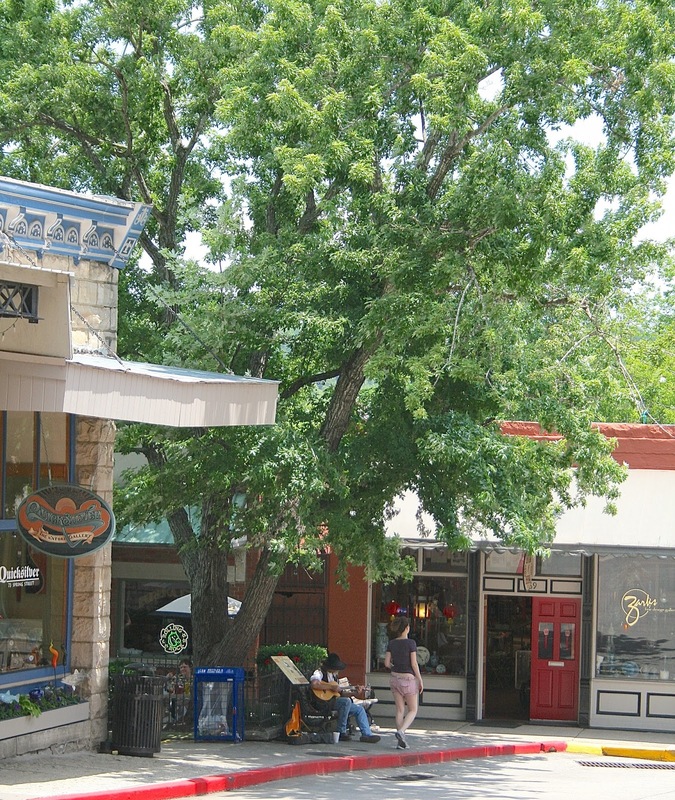 The town is filled with many shops, mostly antiques and artwork. 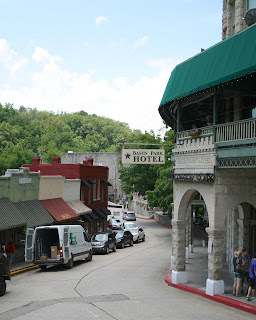 We only went inside a few of the shops, because we were far more interested in the architecture of the buildings and the beautiful Ozarks, than we were in shopping. We did love seeing all the colorful art work dotted all over the town. Below are some beautiful paintings on the outside of a historic building. There are many fun places to eat in Eureka Springs. Here is roof top cafe. I love how the trees nestle in the background of the busy city streets. I always love it when I see an old building built like a triangle into the shape of a street, like the one pictured below. 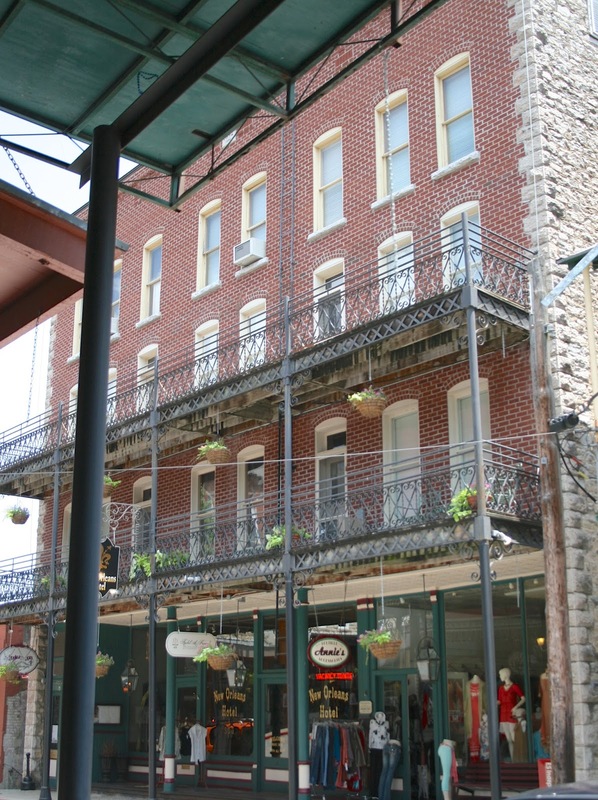 My husband and I noticed a very 'New Orleans' feel to many of the streets with the wrought ironwork over many of the buildings. That's my daughter in the red skirt walking up the city street. A street musician playing music under the tree. 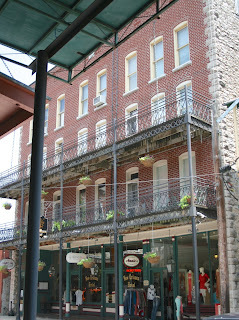 More New Orleans style wrought iron. I found this block one of the most interesting. So rustic. Such a blend of New Orleans/Old Wild West. Notice the date on the stone? Beautiful! How priceless to have this piece of American History still so intact! Look at this old wooden balcony. Love it! Another grand hotel, The Basin Park Hotel, built in 1905. Well I that's it for my pictures and stories of the buildings and streets of Eureka Springs. I will have more pictures and stories to share about the history of Eureka Springs and the Crescent Hotel and Grounds along with 'The Christ of the Ozarks' statue on a later post. It sounds like a wonderful little town Amy. Gorgeous photos! I grew up in Europe and the old buildings are definitely one of the main things I miss. What an amazing little town! Thanks for sharing the photos! Love your photos , what an interesting town. Thanks for sharing. I grew up there. Reading your post made me a little homesick!